Purple will be a prominent colour in interior design this year, and with shades ranging in the pastel mauves to rich eggplants, there is room to play with this vibrant and lively colour. Check out this luxurious living room, with rich deep walls and elegant shapes of furniture, this screams luxury and refinement. Pair purple with grey, white and black for a striking and modern environment. Mix metallics, and use high gloss accents for visual interest. Don’t be afraid to mix and match the shades of purple, here the throw pillows and table lamp are in varying shades and works perfectly together. For a subtle infusion of purple try mauve accent pieces like this living room, with an emphasis again on black and grey as the main palette. Classic furniture shapes with modern patterns help make this feel contemporary but still luxurious. Open picture frames arranged in a cluster is funky and bold without being costly- take a look at vintage or thrift shops for old frames and spray in glossy black and silver. Small pops of yellow can be used to brighten the space up, and this room uses easy items like a bowl of lemons and a small vase with yellow flowers to pop off the mauve, silver, and black colours. Here are a few ways to incorporate the glamorous purple colour scheme into your home! 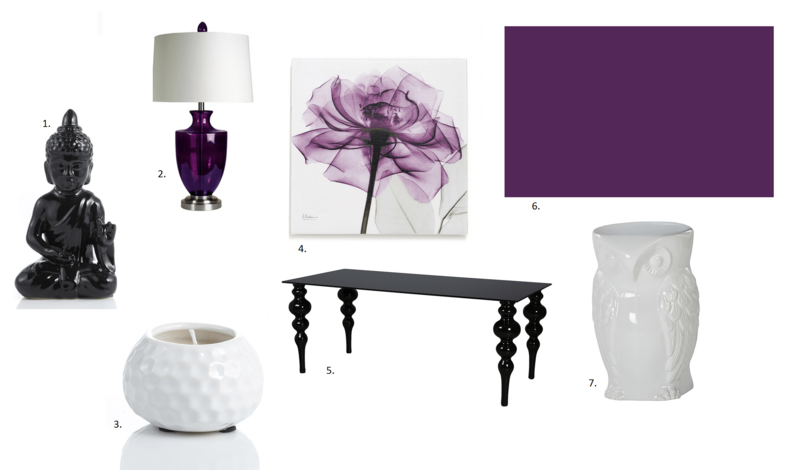 Mix black and white decor with Benjamin Moore #2073-20 Autumn Purple. Next Post Area Rug Winners!